CCA is excited to announce a new book in our collection of recommended reading. 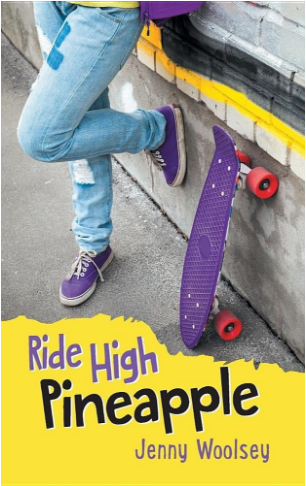 Children’s author, Jenny Woolsey, announces the release of her debut middle grade novel, Ride High Pineapple. This gutsy contemporary realism novel, is a must read for any child or teenager. Ride High Pineapple is written through the honest eyes of a teenager born with a rare craniofacial syndrome, Crouzon Syndrome. She also suffers from severe anxiety. Written as a journal, the story deals with critical childhood issues: bullying, difference, mental illness, friendship ups and downs, and young love. It also shows how one can find self-empowerment through sports. CCA loves this book because it goes along with our educational initiatives in that it is yet another text that is relatable, enjoyable, and features a young person with a facial difference. Offering an additional perspective to Wonder, Ride High Pineapple captures the raw emotions that teen girl, Issy Burgess, experiences. The book presents another lovable character who struggles with bullying at school. Plus, since it's from an Australian author, you'll pick up lots of cool new Aussie jargon!